My dad has been looking forward to grilled lamb while here in Pittsburgh. Not lamb chops but a lamb roast. We have a gas grill. Dad has a charcoal grill. 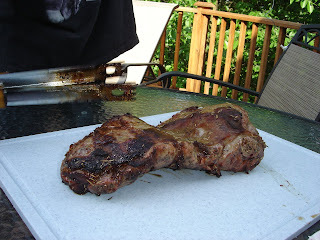 Since it's more difficult to grill a lamb roast on charcoal, he only does lamb chops. So we decided that last night would be lamb roast night. SP marinated the roast in our usual lamb marinade and around 5 pm he put it on the grill. I like my meat well-done while dad & SP like theirs rare. The lamb roast from Costco is nice because once you remove the netting, there's 2 halves and, in all the roasts we've bought, one half is smaller than the other. This means that the small half can be well-done for me and the larger half rare for dad & SP and the cooking time can stay the same. 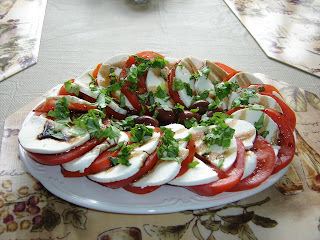 Mom & I made a sliced tomato-fresh mozzarella-fresh basil salad with some kalamata olives in the center. The basil we bought at Lowe's is doing quite well so I pinched off about 6 nice, big, green leaves and chopped them. We drizzled the salad with a balsamic syrup that SP made. He heats equal parts balsamic vinegar and sugar until the sugar dissolves, cools it, and then puts it in a squeeze bottle so we always have some on hand. At 6:30 the lamb was done. We all gathered around the table on the deck - it was a beautiful sunny, warm day - and after letting the roast rest for a bit, SP sliced it. Delicious. 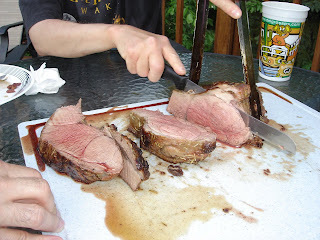 You can see how juicy the meat was in the photo - it ran all over the cutting board and overflowed onto the table!! The tomato-mozzarella salad was a very nice accompaniment. Dessert was fresh blueberries and cherries with whipped cream, but after all the lamb (and a couple glasses of a delicious wine - Gabbiano Chianti Classico), I forgot to photograph dessert!! !